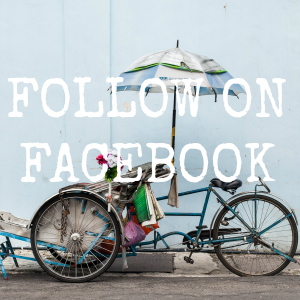 Following on from the previous post, we had been in Kuching for a few days. Now it was time to try to hopefully see orang-utan. 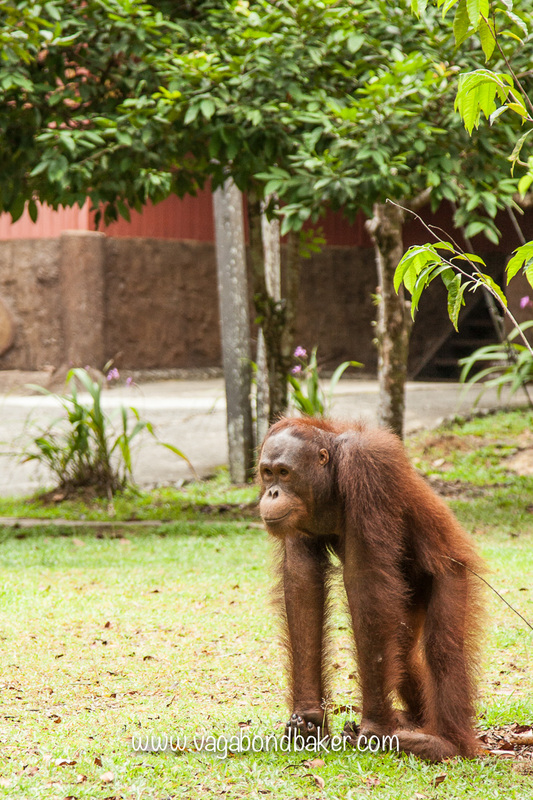 The Semenggoh Wildlife Centre has been rescuing orang-utans since the 1970’s, the centre rehabilitates orang-utans that have been discovered injured or orphaned, or from illegal captivity, and provides them with a safe environment with the hope to return them to the wild. 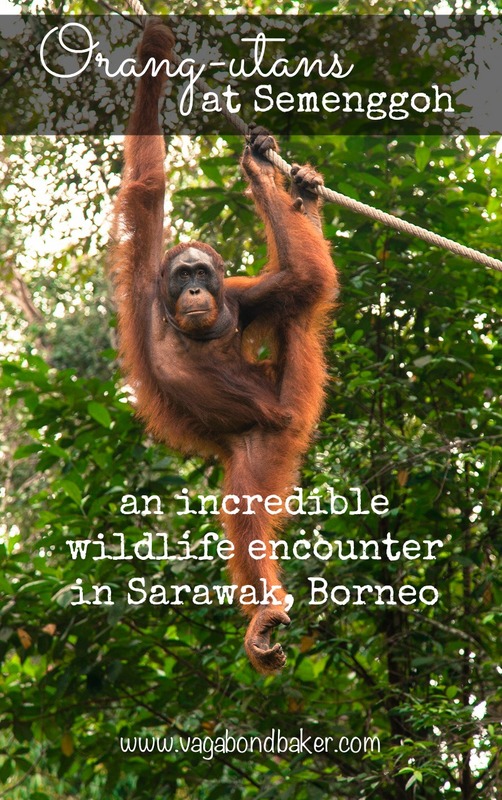 The centre has been so successful that it reached full capacity, now the rehabilitation happens in Kubah National Park. 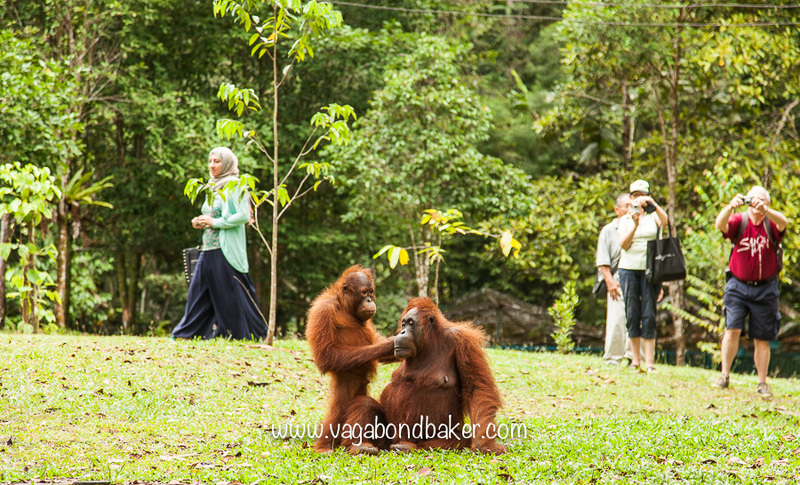 The orang-utans that reside in the Semenggoh National Park are rehabilitated, semi-wild orang-utans and their off-spring, and the centre now focusses on research, studying the orang-utans behaviour and biology. The orang-utans are fed twice a day from feeding stations near the centre, they are entirely free to come and go so a sighting isn’t guaranteed: there is wild fruit and food in the forest too, but the chances are still high. We ended up visiting twice, first for the afternoon feeding on a damp, grey day. 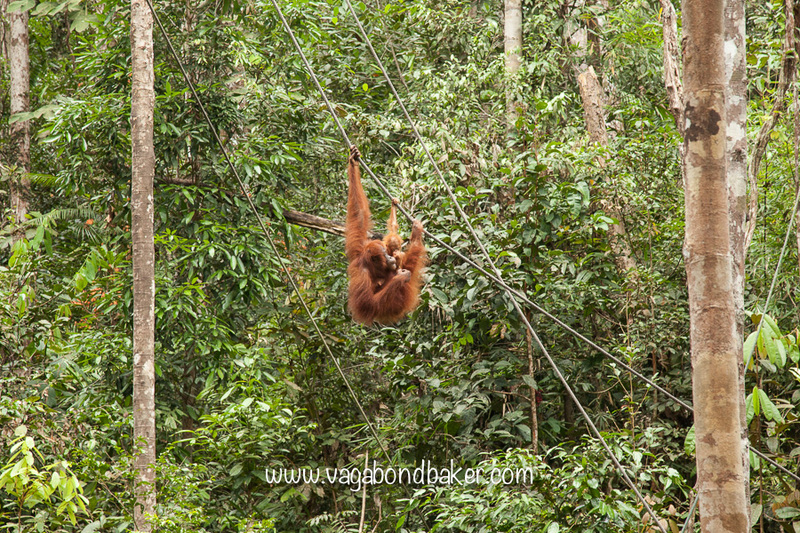 We did see a couple of orang-utan, who appeared from the depths of the forest for some free food. It really is a wonderful feeling to come face to face with these (semi) wild apes, you can’t help but notice the similarities to ourselves: not that I am so agile a tree climber! 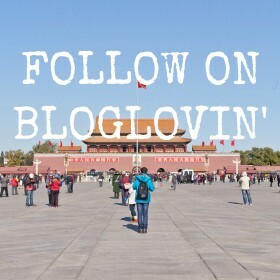 It was a fabulous experience and we wanted more so a day or so later we went for the morning feed. This time it went way beyond my expectations. 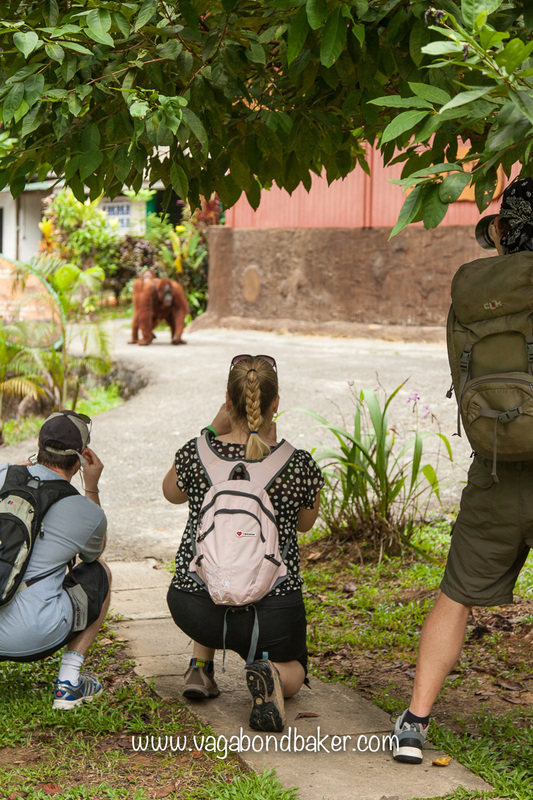 We hadn’t been there long, a couple of the rangers were looking to see if there was any sign of the orang-utans. One was spotted and pointed it out to Chris. It was up in a tree by some buildings, a female with a baby! Then, rather than taking the tree route, she dropped to the ground and came towards us! Baby has a look around! My heart was beating in my mouth, these are wild animals, potentially dangerous wild animals; I’ve read the warnings: stay five metres away, wild animals always have an unpredictable side! 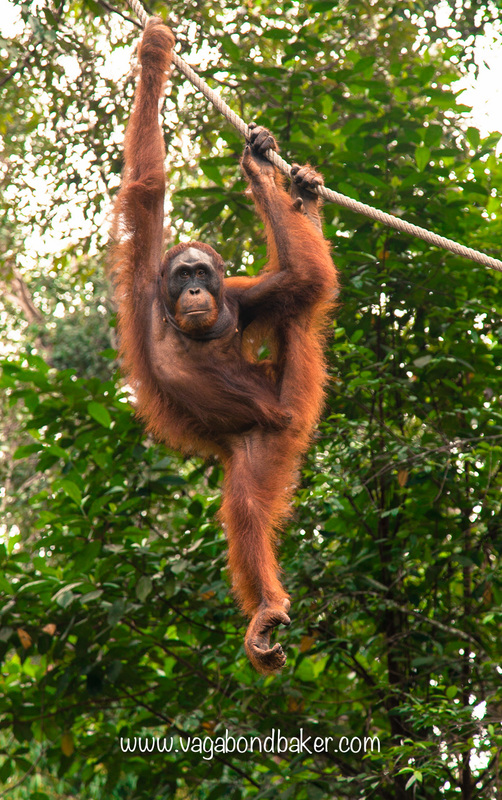 The reason she joined us was probably because there was a young boisterous male orang-utan behind her (the guy dangling with attitude off the rope in the photo above). She came right into the centre of us, sat down for a bit then moved on into the visitor viewing shelter and made herself very comfortable, despite the large crowd gathered around her! It was the most incredible experience. She clearly felt complete trust and safety being among us, both her and her child were entirely relaxed, stretching out on the cool concrete and dozing. The ranger told us he thinks it is because she is cleverly protecting herself, and her youngster, from the aggressive male: she knows he would never come near her with all the humans around. Her young son will eventually become a strong male himself, when he reaches maturity he will gain big cheek pads that will make his face large and domineering. We didn’t see any of the older males unfortunately, no big Richie for us, but what we did experience more than made up for that. Another female swung into the feeding area with an even smaller baby, tightly gripped to her side. It was breathtaking watching them move so fluidly though the branches and ropes. The rangers were feeding them bananas and coconuts. The young males would catch the coconuts mid-flight! It is most amusing watching them eat, it’s amazing how many bananas an orang-utan can fit in its mouth at any one time and they have such expressive faces. 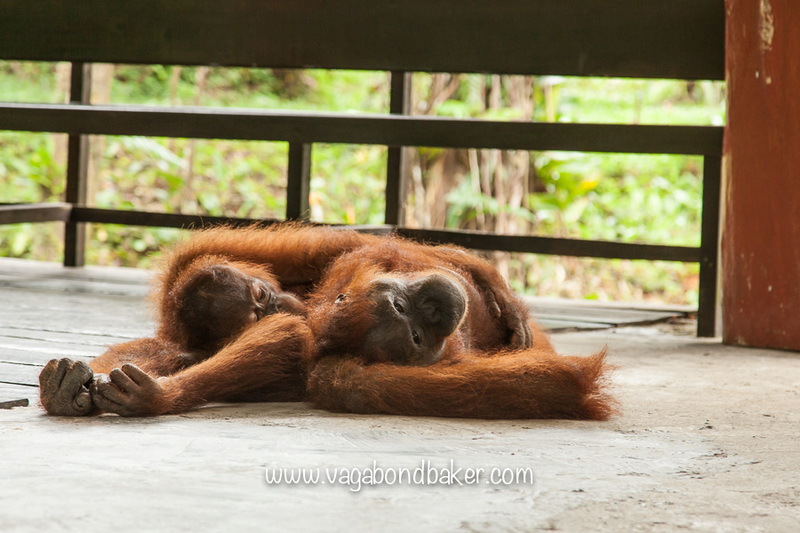 Semenggoh Wildlife Centre is an absolute must do in my opinion. Having visited Sepilok Orangutan Rehabilitation Centre after this, I much preferred Semenggoh. 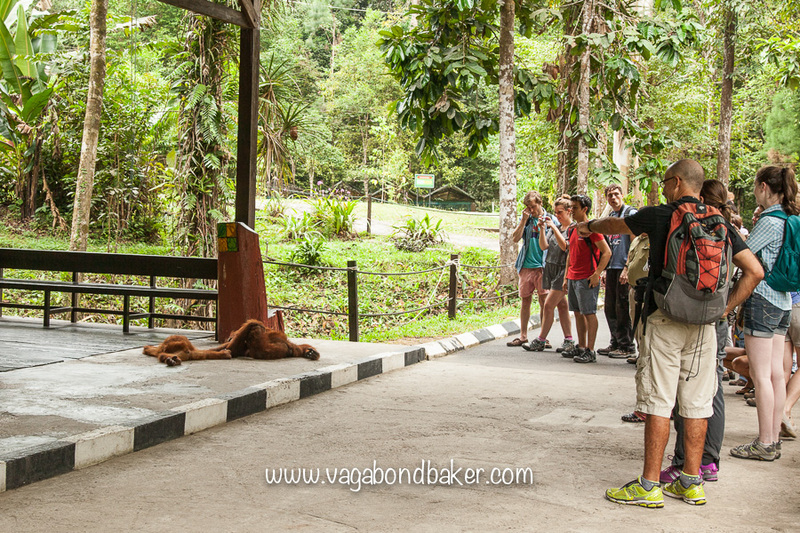 The Semenggoh Wildlife Centre is much smaller, far less touristy and it feels much more intimate. When a female and her baby joins you to chill, you can’t get more intimate than that! It’s also a lot cheaper; still do both though, Sepilok is amazing, just don’t discount Semenggoh: you could have the most incredible experience! 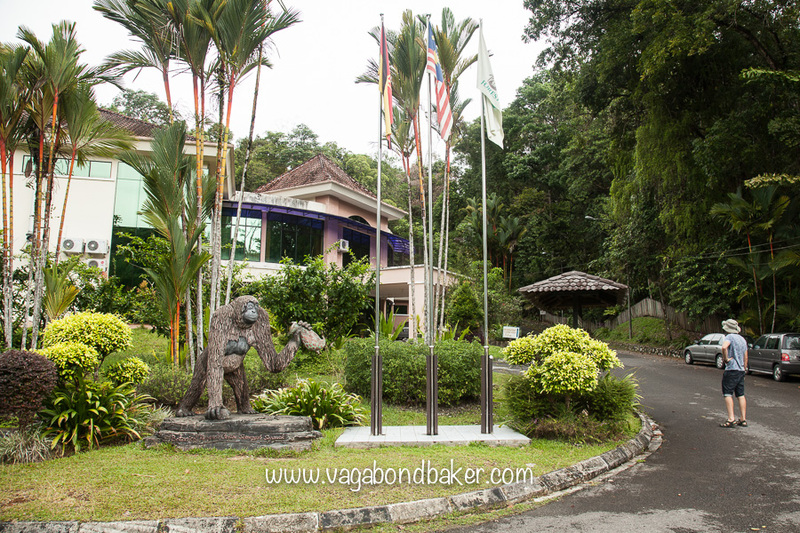 The centre is an easy bus ride from the bus station in Kuching, from the main entrance it is around a twenty-minute walk down to the feeding centre along a track lined with trees and pitcher plants. The feeding times are at 9am and 3pm. Orang simply means man in Malay and utan means forest. 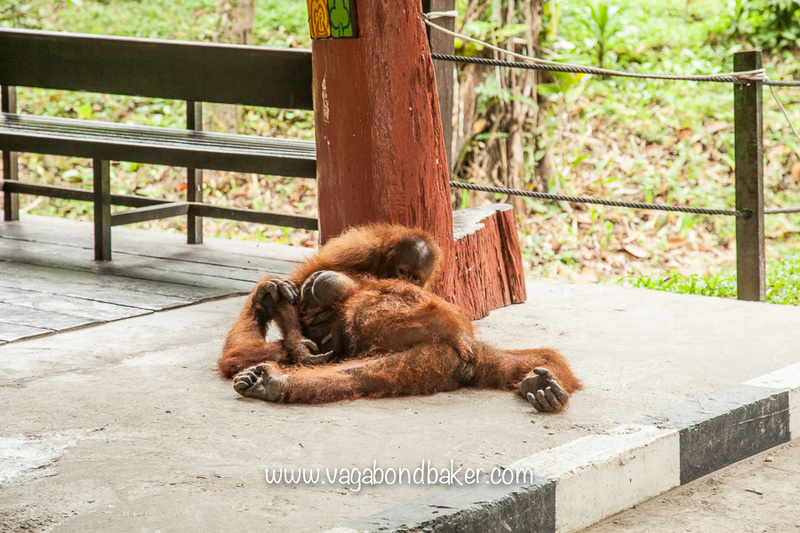 Orang-utans are such special animals, not least because they are so like us in so many ways. Their existence on this planet is fragile though, their numbers are dwindling due to their habitat, the glorious primary rainforest, being cut down for palm oil crops and also through, disgustingly, hunting and the live animal trade. These rehabilitation centres are so important and the education they provide is just as crucial as the work they do reintroducing the animals back into the wild. 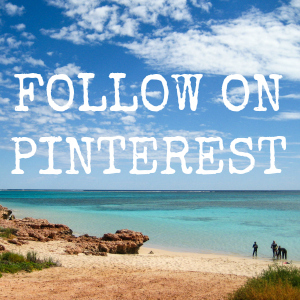 Have you had an incredible wildlife encounter?